The measles outbreak in the US is being blamed on anti-vaccination sentiment, and now the debate has entered the political arena. Major officials have begun to weigh in on vaccine policy and how to balance individual choice with public health concerns. So far this year, 102 people in 14 different states have contracted measles and are considered extremely contagious, according to the US Centers for Disease Control and Prevention. Leading contenders for the 2016 US presidential nominations are seizing on the issue in what some say is political opportunism. Some officials, especially on the conservative end of the political spectrum, say that despite the clear benefits vaccines offer both individuals and the larger community, there should be no mandate to vaccinate. "We vaccinate ours kids, and so, you know that’s the best expression I can give you of my opinion,” Christie told reporters while visiting the UK on Monday. “You know it’s much more important what you think as a parent than what you think as a public official. That’s what we do. But I understand that parents need to have some measure of choice in things as well, so that’s the balance the government has to decide." Yet Christie issued a statement later in the day, clarifying that "there is no question kids should be vaccinated." "The Governor believes vaccines are an important public health protection and with a disease like measles there is no question kids should be vaccinated," Christie's office said in the follow-up statement. "At the same time different states require different degrees of vaccination, which is why he was calling for balance in which ones government should mandate." It's the actual measles outbreak that gives context to the vaccine question. So the most important question is: What do you say NOW? Today. US Sen. Rand Paul, another potential contender for the Republican presidential nomination, called vaccination compliance an “issue of freedom” on Monday. “I’ve heard of many tragic cases of walking, talking normal children who wound up with profound mental disorders after vaccines,” Paul, a doctor, told CNBC. I predicted the GOP would become an anti-vaccine party a few days ago - looks like it's happening even faster than I thought it would. Not all Republicans were as ambiguous as Paul and Christie. "Although I strongly believe in individual rights and the rights of parents to raise their children as they see fit, I also recognize that public health and public safety are extremely important in our society," said Ben Carson, a former neurosurgeon and rising star in conservative political circles, in a statement, according to The Hill. Republican House Speaker John Boehner weighed in on Tuesday, saying, "I don't know that we need another law, but I do believe that all children ought to be vaccinated." There is no clear-cut political divide on vaccine aversion in the US. While some may be worried about an overreaching government decree, many others believe that vaccines can be linked to autism based on research that was debunked and retracted in 2011. President Barack Obama, meanwhile, issued a defense of vaccinations on Sunday. "You should get your kids vaccinated,” the president said in an interview with NBC. Other Democrats excoriated Republicans for wavering, if only slightly, on the issue. “Why is this so hard? 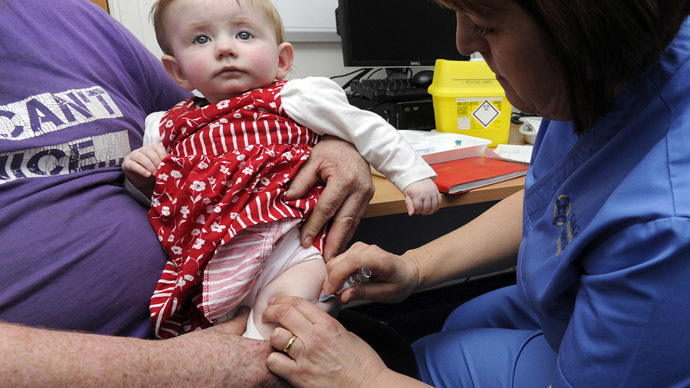 When given the opportunity to show leadership in calling for Americans to vaccinate their children to protect our nation from the spread of disease, shouldn’t this be a no-brainer?” the Democratic National Committee said in a statement. Yet both Obama and Clinton, while running for the Democratic presidential nomination in 2008, dabbled in anti-scientific rhetoric themselves when explaining their perceptions of vaccines. In 2008, Obama said, "We've seen just a skyrocketing autism rate. Some people are suspicious that it's connected to the vaccines. This person included. The science right now is inconclusive, but we have to research it." John McCain, Obama’s eventual Republicans opponent for president in 2008, sounded similar tones. “It's indisputable that (autism) is on the rise among children, the question is what's causing it,” McCain said in 2008 while on the campaign trail. “And we go back and forth and there's strong evidence that indicates it's got to do with a preservative in vaccines." In 2014, instances of measles were as high as 644 cases across 27 US states, marking the the largest outbreak since the virus was declared eliminated in 2000. Most of the cases this year are linked to several dozen non-vaccinated people exposed to measles at Disneyland in Anaheim, California. The measles vaccine is readily available in the US, and has been a major public health success story in the sense that a scientific breakthroughs has been effectively utilized to largely eliminate a disease. 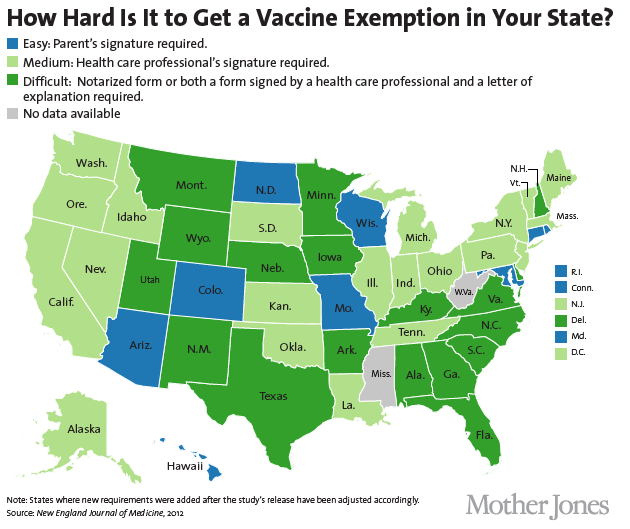 Across the US, vaccination exemption policies vary, as some require a simple parental signature, while others need a health care professional’s sign-off or a notarized permission form. Forty-eight states allow faith-based vaccine exemptions, according to National Journal.